The Tracer Concierge™ system provides an affordable way for building owners to gain simplified building automation for their facility, resulting in improved comfort and performance with reduced operating costs. The Tracer Concierge system provides an affordable way for building owners to gain simplified building automation for their facility, resulting in improved comfort and performance with reduced operating costs. Tracer Concierge goes beyond managing individual rooms, running HVAC and lighting systems simply and smartly from one intuitive interface. • Run your building smartly, and get the feature-rich functionality and advanced capabilities of building automation — right out of the box. This bundled system of proven Trane components and pre-engineered applications provide ease of operation. • Simplified control and operation saves you time in making changes. 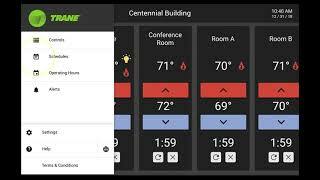 You get easier building management, thanks to a range of built-in functions including overrides, temperature setpoint changes, daily monitoring alerts and various scheduling options. A local interface offers control via a 10-inch touch-screen display that can be changed to reflect your building showing key information at a glance. Manage your building on the go with a mobile app that lets you see critical alerts that require immediate service. • Easier and faster installation puts a cost-affordable building automation system within your reach. Trane® Air-Fi® wireless technology eliminates wired components between devices, reducing installation complexity and time. Pre-engineered, bundled components and a prepackaged control panel also reduce installation risk and cost. • Easily integrate devices in the future and leverage equipment you already have, since Concierge is built on an a platform that supports open standards offering flexibility to best meet your building needs. Building automation can improve performance and efficiency and helps maintain occupant comfort for your facility. Tracer Concierge provides advanced capabilities compared to a traditional programmable thermostat — without added complexity. The result is an easy-to-use, affordable system that offers energy savings, decreased maintenance and worry-free operation. To learn more about the many benefits of Tracer Concierge, contact your local Trane account manager.